The Bear and the Nightingale weaves a tale steeped in Russian folklore. It tells the story of of Vasya and her family - and the strange occurrences that happen in their village. When Vasya's father remarries a woman who is very devout, she tries to banish the old superstitions from the lives of the townspeople. But strange things start happening, and it seems as though the legends Vasya has heard told around the fire are coming to life. 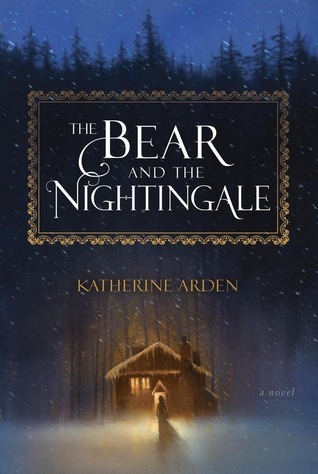 I really enjoyed The Bear and the Nightingale, but I am not sure it is for everyone. It is definitely a book that is more about the way the story is told than the story itself. The writing is very lyrical and beautiful, but there is not very much action at all. It is not a book that will have you sitting on the edge of your seat. There is some action towards the end of the book, but it takes a very long time to get there. Also, like many other books with Russian characters, there are a lot of names that are very similar and have lots of different nicknames. This didn't bother me too much because I am pretty familiar with a lot of Russian names and nicknames, but I know this frustrates a lot of people. There is actually a guide in the back of the book to help you with the names, but I didn't discover it until I was finished reading because I was reading a digital copy. I really loved the beginning and ending of The Bear and the Nightingale, but the middle did drag a bit. There were some parts that weren't entirely necessary to the plot, so I think the middle could have been trimmed down just a bit. I did love the the ending, although there were so many unanswered questions and that is something that usually annoys me. I typically want to know all the answers by the time the book is over (unless there is a sequel). Despite the unanswered questions, I did enjoy the way the story left off; it let my imagination take over. Ultimately, I really enjoyed The Bear and the Nightingale, but it is definitely not for everyone. If you like fast, action-packed stories, this is not the book for you. But if you can enjoy a slower-paced story, then give it a try.